Her comments definitely touched a raw nerve with a society already ultra-sensitive about the safety of its food. Ever since the first tainted milk powder scandal in 2008, the Chinese public’s confidence in the country’s dairy products has virtually collapsed and never fully recovered. In that incident, thousands of young children were sickened by infant formula laced with melamine, an industrial chemical added by producers to boost “protein” readings of their products. As a result of this and many other food scares, every new scandal will cause a heated national venting of discontent, which increasingly takes its target at the government. Early last year, the public debate about McDonald’s selling expired meat in China took an unusual turn when voices sympathetic to the American fast food chains started to challenge mainstream media’s “unfair” treatment of these companies. The commentators turned their fire toward the government, which they thought should be held accountable for not fulfilling its supervisory role over the Shanghai-based Chinese company that supplied the expired meat to McDonald’s. The debate marked a dismantling of the dominant nationalistic narrative that “foreign companies,” instead of domestic regulators, are to blame for such food scandals. Not surprisingly, the Hong Kong judge’s comment unleashed another round of venting. Under the Weibo post by “Headline News,” a popular online news account with more than 30 million followers, the thousands of comments overwhelmingly shared the sentiment of the judge, with some going even further by claiming that there are too many national shames to give a damn. Serious commentators used the opportunity to deepen the discussion into a questioning of China’s “national strength:” The public’s insecurity about milk powder is a reflection of their lack of confidence in the country’s competence in general. What the judge probably did not expect was the fact that she inadvertently stumbled on another fault line that has been very shaky since last year. Just when Chinese netizens were airing their disappointment with food safety, another line of questioning started to develop. “It is more shameless (for the Hong Kong government) to set restrictions for people to buy safe milk powder.” This came from comments picked up by BBC Chinese. Apparently it was referring to the quota system that the Hong Kong government set up in 2013 in response to a public outcry against mainlanders buying up powdered formula. Hong Kong parents complained that it was depriving their own babies of the access to this crucial product. 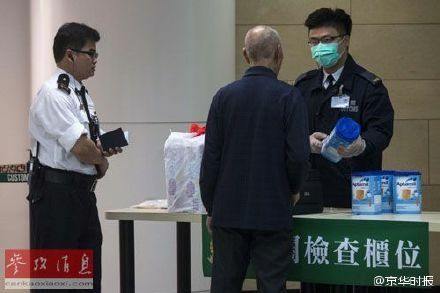 Under the quota system, individuals leaving Hong Kong are allowed to carry no more than 1.8 kg of milk powder (roughly two cans), or they may face penalty and even jail time. A commentator at Southern Metropolis Daily echoed the sentiment of the BBC comment and questioned the value of the quota system itself, claiming that a “new equilibrium” of milk powder supply had been reached in Hong Kong under which the needs of both the Hongkongese and mainlanders could be met without restrictions. But other commentators’ concerns went way beyond the quota system per se. For them, a general anti-mainland tendency in Hong Kong should draw more attention, and this milk powder incident can easily be used to lend power to political oppositions to the mainland. “We should not allow those who advocate ‘Hong Kong independence’ to use ‘anti-smuggling’ as a camouflage,” an op-ed on the pro-mainland Ta Kung Pao proclaims.